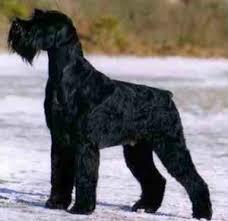 Is this dog a Giant Schnauzer? We got this dog from a shelter and they said she was some kind of terrier mix. She seems to be getting pretty large and looks a lot like photos I've found of giant schnauzers. Is that what this dog is? Will she be 80 pounds someday?? She's around 6 months old now. It's pretty hard to tell from those pics, as the only shot of the face is head on. Can you get some better pics of her head from all angles? I can see why you would think that there could be schnauzer in there, but as with any mix it is impossible to tell for certain, and a case of waiting to see how big she gets as she gets older. Maybe there's some Schnauzer experts on here that can be a bit more help, they're not one of the breeds I know much about. she looks like an affenpincher schanuzer mix... but it is hard to tell for sure but affenpincher is what strikes me at first.. I think she's on the large side for either affenpinscher or standard schnauzer - at 6 months she already weighs 21 pounds and stands 17 inches at the withers. I'm no dog expert - how old is a dog when it reaches it's full growth? oh but dont forget the different traits, also when you mix two breeds the outbreeding can cause a bigger dog geneticly even if the parents were smaller.. The face is looking like an affenpincher, which means that dad might have been one and mom a really big Shcnauser.. but that is just my guess.. If you're certain about the age and weight, no way will that dog grow up to be 80 lbs. She'll be more like 40 lbs give or take. Can't help with the breed though, I'm not up on my Schnauzers at all. What about a kerry blue mix? I'm no expert on dog identification but she does have the look of a lovely kerry blue. but she is cute - love the pictures. He doesn't look like giant schnauzer to me, but I've only seen a few adult ones in their clip/strip. From the 1st shot I can see affenpinscher.